In essence, all the notes are coming back to the RBI. All of them or nearly all. Some will be lost and others with people who can’t come for geographical limitations etc). This means the RBI gets no really meaningful “one time” profit for writing off the unreturned 500 rupee notes, because most notes are returned. No big one-time profit means no big dividend either. And the RBI will spend a lot more money on the collection and printing of new notes. Subject to future corrections based on verification process when completed, the estimated value of SBNs received as on June 30, 2017 is ₹15.28 trillion. SBN = Specified Bank Note = the demonetized 500 and 1000 rupee notes. Only Rs. 0.16 trillion, or Rs. 16,000 cr. has stayed back. That’s about 1% of the total stock of money that was demonetized. Remember how we were told that people were dumping money in rivers? Or that they were burning notes? Because they were scared that returning them would have exposed them to taxes? Well, now it’s apparent they weren’t scared and weren’t doing anything significant. Even the money that hasn’t come back is just a shame, because it probably belongs to people too old to have stood in line, or those that weren’t in India and couldn’t come back to return the money or so on. We’ve been given this monstrous lie that demonetization was for this, or for that. There are negligible fake notes. There is no curbing of black money. With over 15 lakh crore of cash out there, the cash is back in the system, and the babus are demanding bribes in new notes instead. And yes, now they’ll even take PayTM. The excuse is that they have found some taxpayers who deposited more money than usual. That they will collect such taxes big time. But they have already raised taxes – more money from the rich in the form of higher income taxes, and more money from everyone in the form of a high GST. Since demonetization brought all this cash into banks, they dumped the excess cash with the RBI. We had mentioned in our earlier post that we expected the RBI to lose around Rs. 180 billion (18,000 cr.) for paying banks for the few months that the money was kept. We were proven right. The actual loss was Rs. 174 billion. Total RBI income fell by that much – the rest of the items were nearly the same or cross balanced each other. Expenditure increased too, with a Rs. 13,000 cr. kept aside as a contingency fund. There was also about a Rs. 8000 cr. spent on printing notes. With this the net transferrable surplus of the RBI fell from Rs. 66,000 cr. down to Rs. 30600 cr. That’s one cost of demonetization for you – a lower dividend paid to the government. The RBI did benefit a bit. The massive liquidity ensured that their FCNR Redemption of over 100,000 cr. 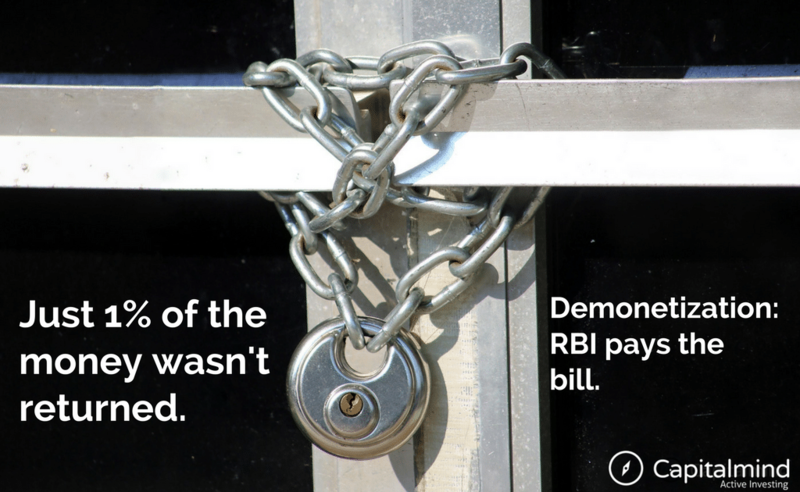 passed through easily – otherwise, when banks paid RBI money to get dollars to return to the FCNR depositors, the liquidity situation would have become tight. Why should I complain? This is a great time for stocks, because the small business has been gutted, as it ran on cash. And then, money has poured into markets from retail investors. We initially thought there would be a recession – and then, as any investor would do, changed our mind and invested even more (we built a special portfolio that continues to do really well, with some modifications). But we got our story, and we got our electoral economics. The worldwide glut of liquidity has helped us supremely. And demonetization has perhaps changed some cash habits for good. But we still have challenges – cash is still the cheapest form of money transfer, and the quickest, and the banks are still refusing to cut lending rates big time even if they have excess money. There are potentially some benefits of demonetization in the form of a tax base that can now be harrassed about why it deposited some money in a bank, but don’t hold your breath about catching any big fish. All in all, the November 2016 dramatics didn’t deliver what it promised, but in the markets we have enjoyed its side effects. This doesn’t change anything for us. Stocks will continue to do their thing. The economy will chug along. It’s just disappointing, but what was done was done. Let’s just stay impressed that our leaders remain popular despite doing this, and hope we’ll get better policies in the future.